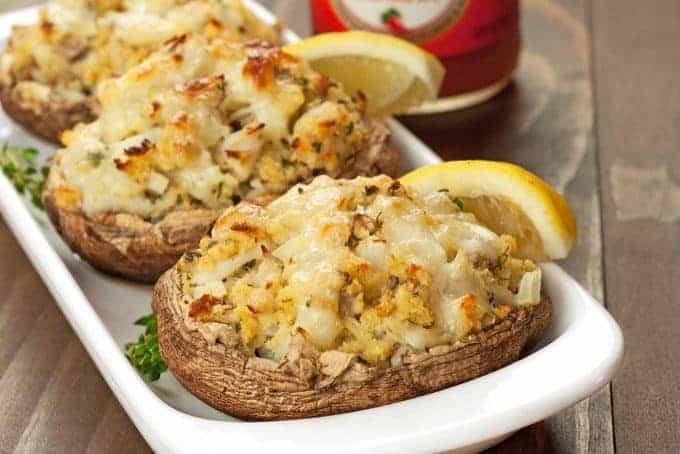 A simple crab cake-style mixture flavored with lemon, fresh thyme and garlic makes a nice stuffing for baked portobello mushrooms. Finished with a topping of melted cheese the dish can be served either as a first course or as a light main course with a salad on the side. 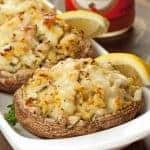 Portobello mushrooms stuffed with a flavorful mixture of lump crab, panko, lemon, thyme and garlic make a delicious, light main course or appetizer. Remove the stems from the portobello caps, finely chop them and place in a mixing bowl. Remove the mushroom gills, then brush the caps clean and arrange them in a single layer in a shallow baking pan that’s been coated with nonstick spray. Season each mushroom cap with salt and pepper and set aside. Add the crab, egg, panko, onions, garlic, thyme, lemon juice, salt and pepper to the chopped portobello stems. Gently combine all the ingredients and divide the stuffing between the mushroom caps. Gently compress the stuffing to form a slight mound in each mushroom. Bake until the crab mixture is set and light golden brown, 9 to 11 minutes. 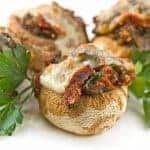 Remove from the oven, top each mushroom with grated cheese and bake for an additional 2 to 4 minutes, or until the cheese is melted and bubbly. Serve with lemon wedges and hot sauce if desired. Feel free to add a little extra cheese if desired, but keep in mind that it’s not meant to be a predominant flavor in this dish. We recommend Muenster, Gruyère or Havarti for best results. All of these cheeses melt easily and have a mild flavor that complements the crab well. Love this recipe – it goes over big as an appetizer ! It disappears quickly. So glad you liked the recipe. We appreciate you taking the time to let us know. 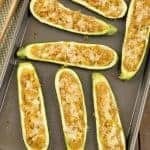 Can you prepare the night before and then put in the oven or should it be prepared on the same day? This is what I would do for best results: Clean the mushroom caps as directed, but don’t salt them. Store them in a paper bag in your refrigerator’s vegetable crisper. Prepare the stuffing as directed, grate the cheese and refrigerate both separately. 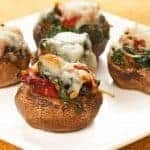 About a half hour before you’re ready to serve, preheat the oven, season the mushrooms, stuff and bake according to the directions. Hope you enjoy! I tweaked the recipe a bit,I switched the thyme with cilantro and the muenster cheese with pepper jack and to the stuffing mixture i added some Dave’s insanity sauce.It turned out PERFECT! Hi Brent – You gave the recipe a nice twist – a bit of a Mexican flare. Great idea! Thanks for sharing it with us. can I substitute another seafood for crab…. minced clams? Yes, I do think you could use minced clams (well drained). You could also pre-cook some shrimp, scallops or a mild white fish like tilapia, chop it fine and use that in place of the crab. If I was going to pick an alternate, I think my top choice would be the fish, but I’d love to hear what you choose and how you like it. Do you drain the crabmeat if canned? Yes, you do want to drain the crabmeat. I am making this tomorrow for lunch!! I just bought all of the ingredients tonight at the grocery store. I have been waiting patiently all week to get my paycheck and go shopping. I can’t wait. It looks absolutely delicious!! Thanks Amanda! I hope you enjoy them. I definitely enjoyed them! They were delicious. I hate to change recipes but I had to substitute the bread crumbs for a gluten free kind; because I am intolerant of gluten. But the rest of the recipe i kept unaltered. It was worth the trip to the grocery store. Glad I found this on line as I left all my old recipes when I moved abroad. 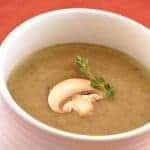 This is fantastic as a first course or for part of a main meal. It is particularly good if any of your guests do not eat meat. I agree with the comment about not overdoing the cheese as it really is more of a light binder but if you have to use fake crab and depending on where you are, you may. Vary the flavor with fresh herbs such as tarragon. I just happen to have a container of crabmeat in the fridge and will be trying this very soon. Very nice flavor. I was searching for something that fits a diet we follow for health reasons. This was perfect. Newcomer to ur site. Looks fab. Will keep it handy.